What is your job? I am a musician, guitar player to be exact. Animal rights, environmental causes, taking care of our forests, rivers, oceans, air... to see that connection. What charity do you support? Farm Sanctuary. There is a personal tie because I love animals, and feel a connection with them. I became aware of Farm Sanctuary’s work and wanted to help. 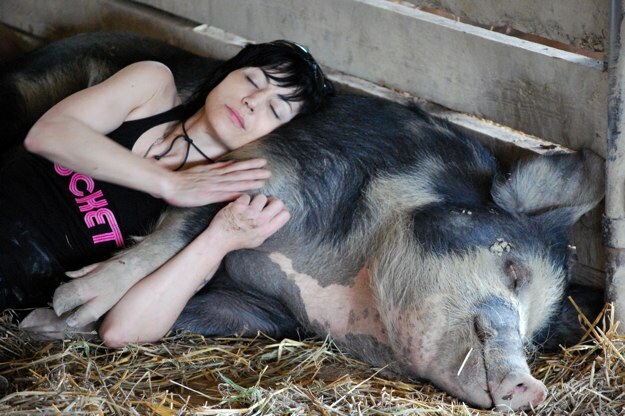 Farm Sanctuary has 2 farms where they bring the animals they rescue. One is in upstate New York and one is in California. I just went to visit overnight in New York, and it was an incredible experience! I met my namesake, Joan the pig! I really enjoyed meeting all the animals. I highly recommend the experience! To become vegetarian, or vegan. I am vegetarian, I have fluctuated between the two, but my goal is to be vegan. It helps the animals and the earth. I have a fighter jet on my left hip, done at Lyle Tuttle's shop in West Hollywood, CA. Everything else was done at Daredevil Tattoo in New York City. I have a Labris inside double female symbols on my sacrum, an om symbol on the back of my neck, a Greek symbol for victory and progress on my ankle, a spiral with rays radiating out on my left forearm, a figure 8 arm band on my upper left arm, and a triangle with loops and swoops above the figure 8 arm band.